What I'm Altering Today: Help! 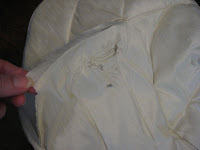 The Vacuum Chewed my Bedspread! My client was having a bad morning. She's trying to get things done, in a hurry, as most of us are, and didn't bend down to lift the bedspread while running the sweeper. Oh, dang. Brand new spread, too. So here's what I did. 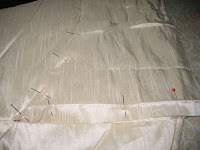 I carefully sectioned off a piece to remove, one edge along a seam line and bottom edge. 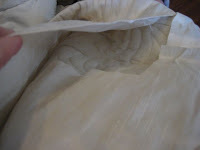 Next, I used a piece of fabric from the back of the pillow sham. 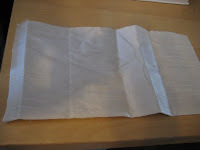 This I replaced later with a piece of cotton lining fabric. 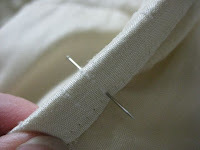 I carefully topstitched this to the raw edge, mimicking the decorative stitching on the spread. 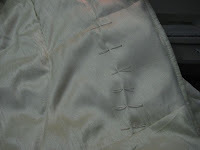 Then I stuck the raw edges under the binding, then stitched all layers together. 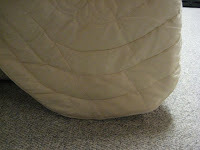 The tricky part here was matching that quilting stitch. 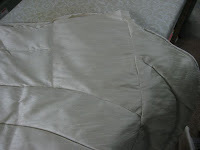 I pin marked the curve, then stitched through all layers, to "machine quilt" the fabric together. The finished product looks so much like the original, she could hardly tell what I had done. What do you think? Leave a comment if you like. Maripat, you're an artist!! What beautiful work you do. :) This is a time-honored, nearly lost art. You and your work are treasures!